RawArt Gallery is pleased to announce the opening of Boyan's second solo show at the gallery. 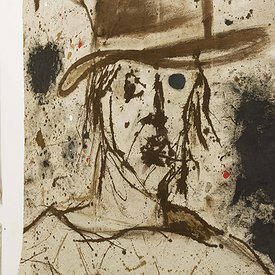 The new exhibition, titled "Bill", assembles various large-scale works created in the last two years into one painting installation. "Bill" is Billy the Kid, and Buffalo Bill, and Wild Bill Hickok, and the assassin-come-object of revenge in "Kill Bill." 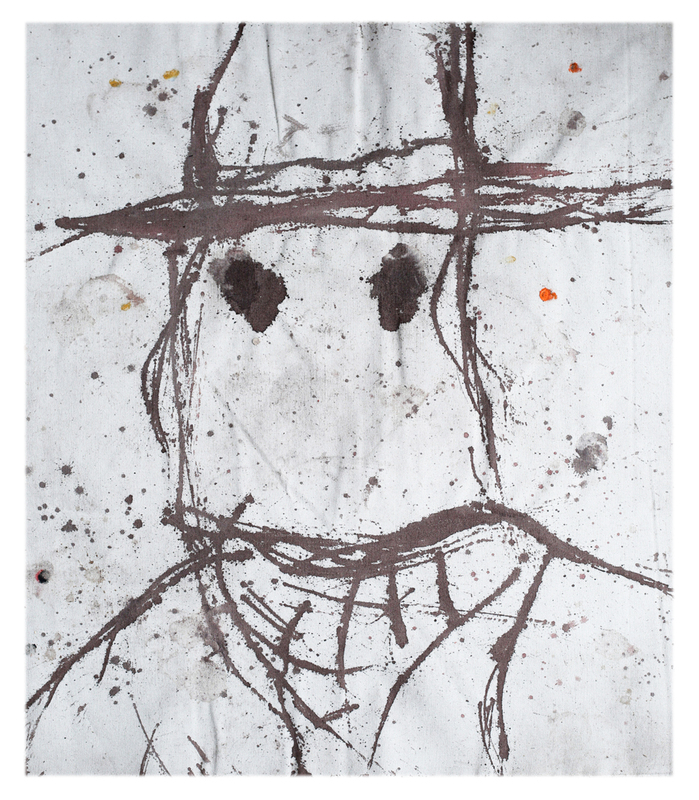 Bill is a figure that keeps showing up in different works by Boyan over the years. 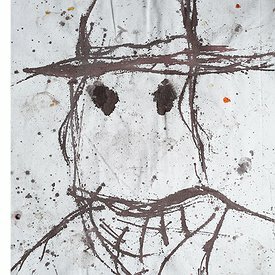 In his current exhibition it stands for any figure that appears from a stain of paint – a figure that is not a portrait, but a mask, a persona, a sign that breaks through the bottom of the painting, emerges from its hiding place in the depths of the canvas, materialized by the serial painting action. 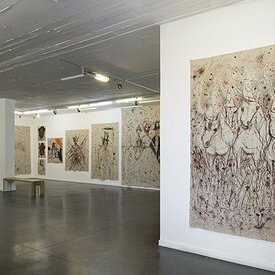 The large-scale paintings filling the gallery space were painted by Boyan in his studio for the last 2 years, and they are, in fact, an accumulation of hundreds of meters of fabric laid over time on the studio floor. 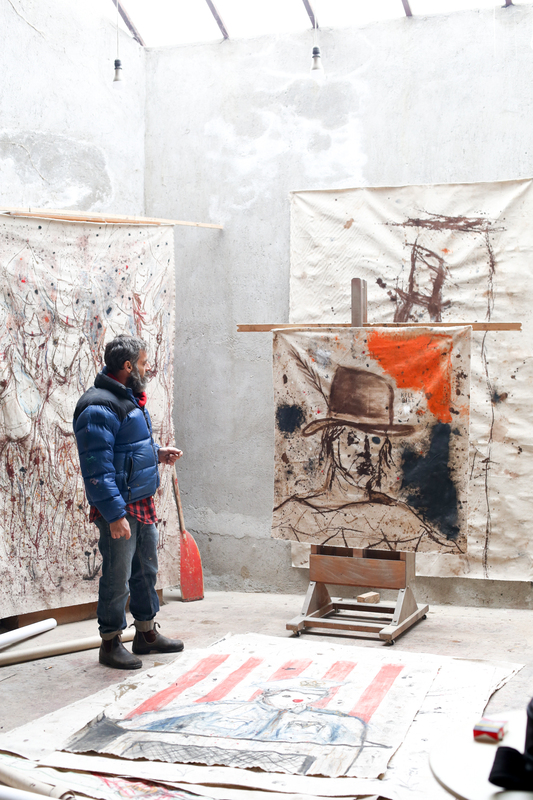 To paint on the linen covering the floor, Boyan uses a color dripping technique in the tradition of Jackson Pollock (who himself was influenced by Native-American painting traditions). 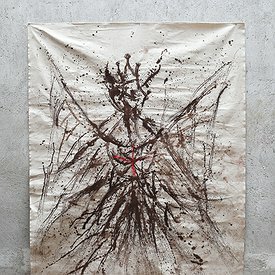 Paint stains merge with the residues of time accumulating on the cloth in the studio and react to random formulations of form and figure. 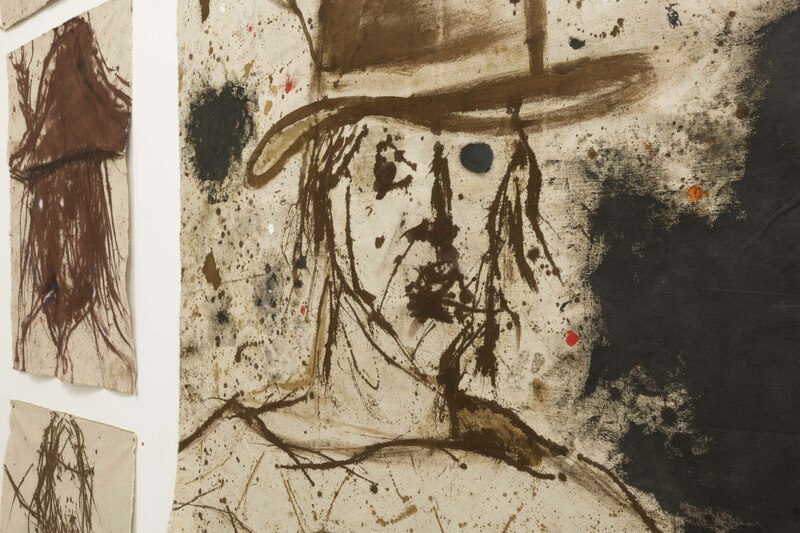 Only after the painting has materialized, and the figure emerges, the canvas is cropped. The canvases do not undergo any preparation process or stretching before the painting, and they are installed in the gallery accordingly – exposed and unstretched. No painting is more important than the other. 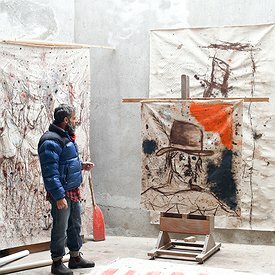 This time, the meaning lies in the sequence – in the painting action that stretches across tens of meters of fabric, and which awakens those familiar Americana figures – outlaws who are law keepers, snipers and executioners, avengers and wanted men, who are also expert in the art of the show. This exhibition also marks the launch of a new catalog covering Boyan's previous show at the gallery ("The Balloon Catcher," Dec 2015-Jan 2016). The catalogue includes essays by Menachem Goldberg and Leah Abir, as well as a special section of images of Boyan's work on book covers. A gallery talk with the artist and the curator will take place on Saturday, February 17, at 12pm. Born in Bulgaria in 1975, Boyan lives and works in Israel and Bulgaria. He studied at the Bezalel Academy in Jerusalem and the SVA in New York. 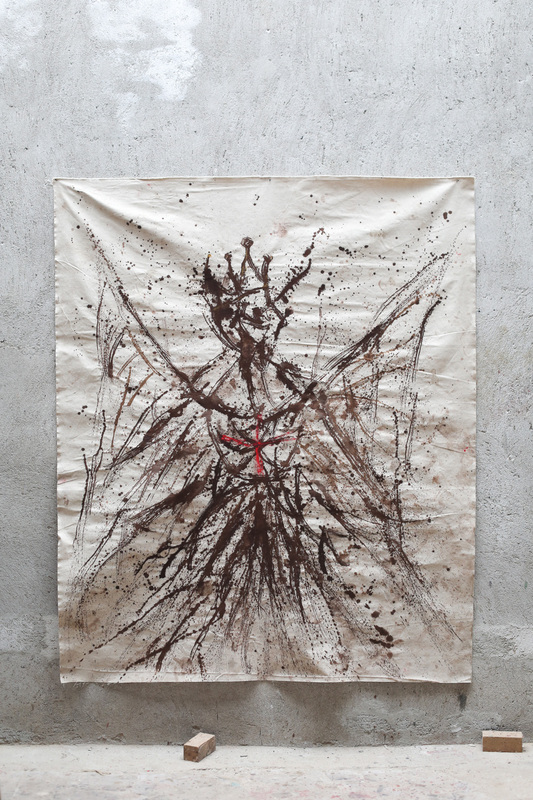 Boyan has had solo exhibitions at the Herzelyia Museum, Raw Art Gallery, Sommer Gallery, and 39 Gallery in Tel Aviv. 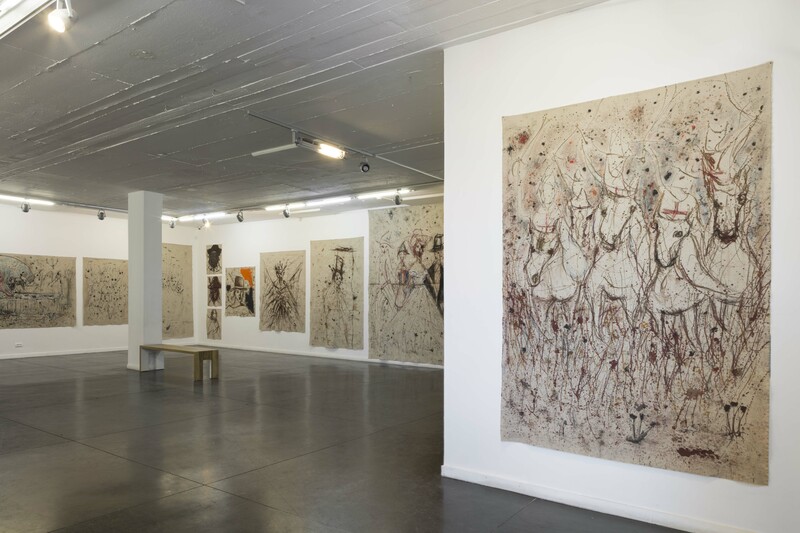 His works have been shown internationally in group exhibitions in venues such as the Herzelyia Biennial, The Haifa Museum, MoBY (Museums of Bat Yam), and Peter Klichman Gallery in Zurich. His works are included in private and public collections in the UK, Switzerland, the US, and Israel.